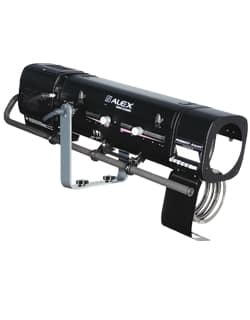 Television’s tungsten favourite The Alex long throw tungsten followspot blends well with conventional theatre lighting and maintains the flat beam and constant colour temperature during dimming which is so important to sensitive camera equipment. 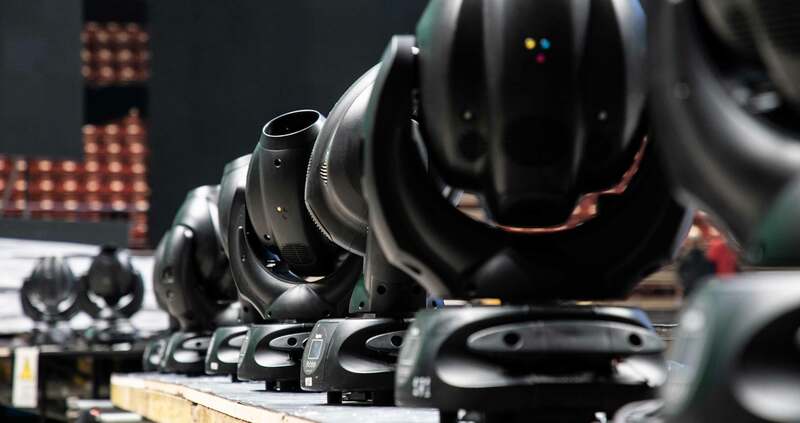 Ideal for television studios, opera houses and ballets. 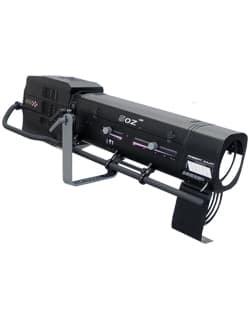 Followspot Features Optical Construction f • Fully closing iris cassette: removable for fast, easy replacement; protective backplate for extended lifespan • Universal adjustable gobo holder: "A" size glass and metal gobos • Ergonomic dimmer control: one-handed dim, pan and tilt. Dimmer control can be adjusted to suit the operator’s preference • Smooth dimmer shutter: retains flat beam and colour temperature when dimming • Frost filter: on flip lever for quick soft-edge beam effect • Horizontal chopper (optional): for masking control in TV studios and wide stages • Internal glass filter holder: long term use of durable coloured, dichroic or textured glass • Individually removable colour frame: gels replaced easily while colour cassette remains in place • Colour changer: 6-way, self-cancelling boomerang colourchanger • Easy focus reference: graduated scale on side of lantern; fast and easy refocusing • Adjustable yoke (optional): for optimum overhead positioning • Fine balance: precision positioning and smooth operation even with the smallest movements • Stand: perfectly weighted for maximum stability with smooth rotation for optimum performance. 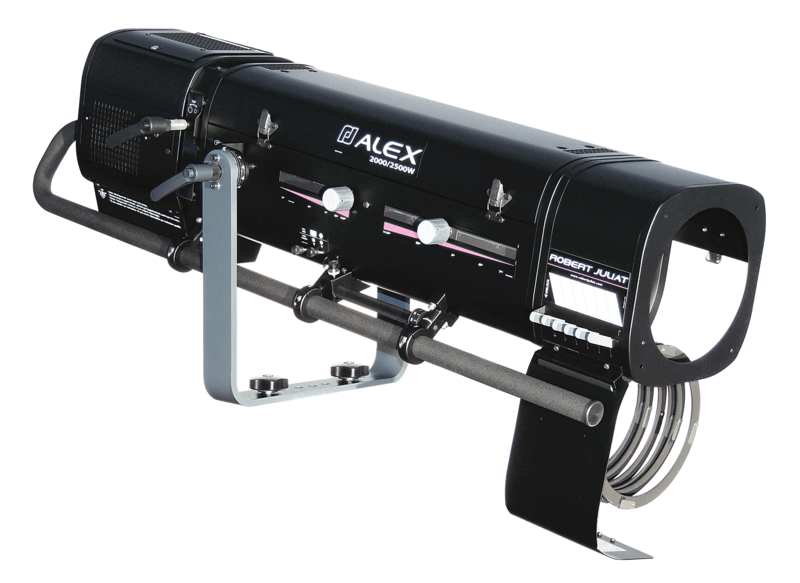 Easy set up; triple safety system for extra security • Factory set optical train: travels safely within followspot and requires no time-consuming realignment on arrival. 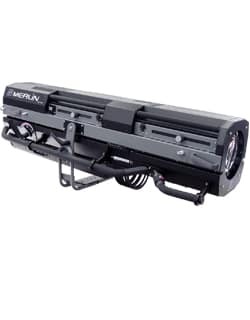 Uniform beam on all followspots of same type • SX optical system: double condenser optics for exceptional optical quality • Gobo : excellent gobo projection • Variable zoom optics: sharp focus at every beam angle. Independent control of image size and focus. • Made in France : fully manufactured in Robert Juliat premises retaining complete control over all aspects of quality • Local ON/OFF switch • G22 socket locking system exclusive to Robert Juliat: holds the lamp securely in place to ensure there is no arcing, even when the fixture is pointing vertically downward • Bodywork: strong sheet metal construction for durability • Ergonomic wrap-around handle: comfort, safety and practicality from all operating positions • Moving parts: smooth at all times, even when hot • Captive knobs and handles: additional security when working at height or in transit • Easy access to all parts: easy cleaning, re-lamping and maintenance • Removable assemblies: fast-plug cable connectors and complete component assemblies (mirror, condenser set and lamp house assembly) save maintenance and cleaning time AMG International è il leader nel settore rental di materiale audiovisivo. Con sedi a Roma e Milano lavoriamo su tutto il territorio nazionale.